Interested in taking lessons with Terrance D.
A graduate of Berklee College Of Music in Boston, MA, terry received his Bachelors Of Music (BM) in Music Composition. One of his main beliefs is having lively lesson sessions with all of his students from beginner to advance levels. Playing duets with his students is always a high point of the daily lesson schedule. His mantra is ‘music is a creative art form’ and he encourages the art of improvisation with all of his students. Because a majority of his students are in the public and private school band programs, he balances working on the curriculum from the schools as well as including advancing techniques involving scale and technical studies. Many of his students have advanced their seating in their school band as well as being picked to join advanced level groups such as District, Regional and Virginia State bands and the Blues Alley Youth Orchestra. He is an active live show and recording performer. 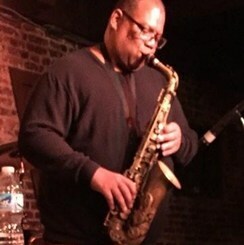 Locally, Terry has performed with various musical groups in venues such as Blues Alley, the Birchmere, the Howard Theater, Wolf Trap and the Bayou. His joy of music is always brought forward during each lesson and he makes the lessons a fun experience for all of his students. Request Lessons with Terrance D. today!